Are You Ready to Launch a DivorceCare Group? 10 Locations. 10 Stories of Transformation. More than 14,000 churches worldwide have been equipped with the DivorceCare program. Passionate lay people facilitate each local DivorceCare group. We’d like to introduce you to ten of them. Pastors: Share it with church members who might want to start a DivorceCare group. Current DivorceCare leaders: Use it to recruit new members to your team. Future DivorceCare leaders: Share it with your pastor and fellow church members to cast a vision for a DivorceCare group. 10 Locations. 10 Stories of Transformation. More than 14,000 churches worldwide have been equipped with the DivorceCare program. Passionate lay people facilitate each local DivorceCare group. We’d like to introduce you to ten of them. DivorceCare enables your church to offer ongoing weekly support groups for people who are separated or divorced. We help you equip a lay-led team for effective ministry to people in your church and throughout your community. Through DivorceCare, you can provide biblical, Christ-centered hope that will help hurting people rebuild their lives. The purpose of DivorceCare is to transform lives impacted by the pain of divorce or separation. But DivorceCare has another ancillary benefit—changing and improving the lives of those who facilitate the curriculum. The stories of transformation of these leaders are many. In this short book, we present 10 compelling stories from leaders scattered across the country. It is our hope that these stories will inspire you as you consider launching a DivorceCare group at your own church. To begin a DivorceCare group, visit Start a Group. Begin this exciting journey there. This book is dedicated to all DivorceCare leaders—the thousands of men and women who have used the curriculum to bring God’s healing touch to so many during the past 20 years. 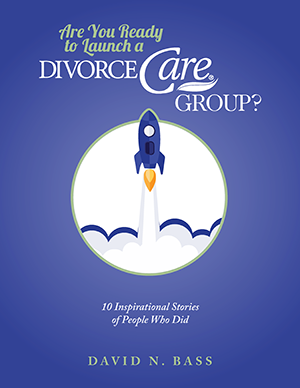 In a small way, the 10 stories contained in this book reflect the countless stories of renewal and redemption that DivorceCare leaders around the world share in common. Our thanks goes out to them. DivorceCare is blessed to have a group of committed facilitators who give their time and energy to so many others. Some of these facilitators have been volunteering almost as long as DivorceCare has been around—since 1994. Kay Jaton is one of them. Kay Jaton describes her decision to become a DivorceCare facilitator as a calling placed on her life by God. As a resident of Omaha, Nebraska, Kay has led a DivorceCare group since 1997. When she experienced her own divorce in 1981 after 21 years of marriage, Kay noticed that there weren’t any divorce recovery meetings or groups tailored to single adults in churches. It was support she needed but didn’t get. So when she heard about DivorceCare 16 years later, she couldn’t have been more thrilled. Kay’s pastor learned of the DivorceCare program and asked her to head a group at their church. She did so first as a volunteer, then as a part-time employee at the church, and eventually as singles and recovery ministry director. Amazingly, Kay found that her experience in DivorceCare offered her healing, in addition to healing more recent divorcees. In addition, Kay indirectly served as an important catalyst for expanding DivorceCare leader-training efforts across the country. Along with other leaders in the Omaha area, Kay created a grassroots local-leader fellowship that provided vital training to other facilitators. During her time facilitating DivorceCare groups, Kay has many heart-warming stories to share. One of the most compelling involved a married couple who had lost a son to suicide. As a result of the emotional strain, they decided to separate. The wife went through DivorceCare once, and then decided to take it a second time. The husband ended up coming to the session on forgiveness and reconciliation, and he shared his pain and received healing. Due to her almost two decades as a DivorceCare facilitator, Kay has become a stronger Christian. Ken and Pati discovered DivorceCare at Church by the Glades in Coral Springs, Florida, separately. After receiving healing from their own past divorces, God brought them together as a married couple. Today, He uses the Bakers to reach hurting people through the DivorceCare ministry. Pati found herself in a difficult place in 2009. Although many years had passed since her two divorces, she continued to struggle with unresolved anger and resentment stemming from the ending of her marriages. She approached her pastor at Church by the Glades for help, and he raised the topic of DivorceCare—and Pati’s need for it. After attending two cycles of DivorceCare, Pati took the next step by agreeing to become a facilitator. Not long afterward, Pati took an even more significant leap of faith by assuming responsibility for overseeing the entire DivorceCare group. She had no idea that God was orchestrating events so that she would soon meet the man who, one day, would become her husband. Ken, who serves as pastor of care ministries at Church by the Glades, was not looking for a relationship at the time. He was busy co-facilitating the church’s singles ministry when he was asked by church leadership to help facilitate DivorceCare as well. “I agreed to help lead DivorceCare reluctantly, because I didn’t want to delve back into those issues again,” Ken admitted. He had been through divorce before and didn’t want to go back. Ken saw firsthand how God turned his “mess” into a powerful message of healing for others. “Despite who I am, despite my past, God still uses me,” he said. Another DivorceCare leader encouraged Pati to attend the church’s single groups. She met Ken there. As a newly married couple in 2011, Ken and Pati took over the church’s DivorceCare ministry as a married team. For the Bakers, the best part of the past four years of ministry has been to see how divorce recovery has transformed people’s lives. “Seeing a number of marriages reconcile has been a blessing,” Pati said. For Ken, facilitating DivorceCare has reinforced the power of listening rather than immediately seeking a solution to a problem. “God will bring the people where they need to be,” Ken added. From the time that DivorceCare was first released in 1994, Robert and Brenda Campbell have faithfully served as facilitators—experiencing new strength for their own marriage and seeing hundreds of other individuals healed along the way. Do you remember a time when VHS tapes were the norm and the acronym “DVD” hadn’t even been created? It wasn’t that long ago. When DivorceCare first became available to churches in 1994, the sessions were recorded and released on VHS. It’s something that Robert and Brenda Campbell remember well. They were among the earliest DivorceCare leaders. The couple first encountered the teaching materials in the summer of 1994. In the fall of the same year, they signed on as facilitators of their first 13-week session at Dunwoody Baptist Church, located just outside Atlanta, Georgia. That first session drew a huge crowd—around 40 people. Nothing like it had been offered in the community until that point. Even though the Campbells were facilitators, DivorceCare was helpful to their own marriage. At the time, Robert and Brenda were recent newlyweds. Both had experienced divorce in their lives before—Brenda in the mid-1980s and Robert in 1990—so the videos helped them in their young second marriage. “That first year of going through the VHS tapes helped us grow in our marriage. We saw the tremendous healing that took place with others as well,” Robert said. By 1996, Robert and Brenda had switched to another church—Peachtree Corners Baptist Church—closer to their home, and they began facilitating DivorceCare there. The Campbells have continued ministering at Peachtree Corners ever since, and they’ve facilitated DivorceCare year-round, with no breaks until the summer of 2014. Even around holidays, or if the church had closed for some reason, they would conduct DivorceCare at their house. While working his tech job, Robert was always careful to protect Wednesday nights so that he could faithfully be there for the DivorceCare meetings. Even now, as a retired couple, the Campbells schedule their travel around Wednesday nights for the same reason. Jim Tillerson has faced a troubled road over the past few years—losing his job, experiencing a divorce, and continuing to battle multiple sclerosis. But God has used Jim’s struggles for a greater purpose by inspiring him to facilitate a DivorceCare group in New Mexico. God has helped Jim overcome. In addition to Dallas Cowboys and Boston Red Sox’s sports paraphernalia, the first thing you’ll see upon entering Jim Tillerson’s room is an eight-foot banner bearing the words from Jeremiah 29:11: “For I know the plans I have for you, declares the LORD, plans for welfare and not for evil, to give you a future and a hope” (ESV). Jim has faced a more daunting road than many others—he suffers from multiple sclerosis and uses a wheelchair. Because of his ailment, Jim has struggled with depression, particularly after his own divorce several years ago. But Jim found hope through DivorceCare. Going through the sessions particularly impacted him because he could see other women who were broken by the pain of their own divorces, and Jim felt that his own ex wife wasn’t broken at all. Jim particularly senses God’s call to minister to others who are weathering the journey of depression. Jim’s background—losing a job, facing a divorce, and enduring MS—uniquely positions him to encourage other sufferers. “I like to share my story so that people know there is a way to get through depression,” he said. While serving as a facilitator, Jim has also learned to appreciate the unique struggles that others face. Having no children himself, he has been moved by the stories of men and women who persist through divorce with children in the picture. “I can’t imagine going through divorce while trying to help your children survive as well,” he said. Dennis and Jacci Schumaker met through DivorceCare. During their three years of dating and 10 years of marriage, the Schumaker’s have faithfully served as DivorceCare facilitators. They’ve experienced a God-ordained journey of healing and renewal. Can a horseshoe-shaped booth at a restaurant be a pathway to romance? In the case of Dennis and Jacci Schumaker, the answer is yes. Their relationship was built through shared service in the DivorceCare ministry—and a providential meeting at a local restaurant. In Dennis’s case, he encountered DivorceCare while seeking a path of healing from his own divorce, which occurred in the late 1990s. He attended two sessions of DivorceCare at Grace Church in Eden Prairie, Minnesota. Along the way, Dennis’s leader noticed that he had a lot of wisdom to share and suggested that Dennis join the leadership team—an opportunity that Dennis accepted without hesitation. For Jacci’s part, she encountered DivorceCare seven years after her own divorce. By that time, she had already experienced some level of healing, but none of the resources she had encountered had been biblically based like DivorceCare. In God’s providence, Jacci attended the DivorceCare class led by Dennis at Grace Church. The Christ-centered healing she experienced was a breath of fresh air. About seven weeks into the class, she felt the Holy Spirit prompt her to join the ranks of leadership and bring the curriculum to her own church. “That’s how the Holy Spirit works—He nudges our hearts to get involved in something that we would not have attempted on our own,” Jacci said. Jacci and Dennis’s romance blossomed at the conclusion of the “Boundaries” class. All of the leaders in Dennis’s church decided to go out to dinner to wrap up the semester. Jacci and Dennis were the first to arrive—they initially sat on opposite ends of a horseshoe-shaped booth in the restaurant. This changed as leaders and participants—who initially said they couldn’t make it—kept coming and filling in the seats, pushing Jacci and Dennis together. “I had been praying at the time that if God wanted me to be in a relationship, that person would be an active Christian and would be willing to grow,” Jacci remembers. “I had taken an interest in Jacci, but I didn’t want to move ahead of God and was waiting for His direction,” said Dennis. Today, Dennis and Jacci have been married for almost 10 years. During that time, they’ve continued to faithfully serve as DivorceCare facilitators. Leadership is a rewarding journey as well as a healthy pathway of strength for their marriage. If they have marital conflict, the Schumakers are committed to resolving it. This often happens just before weekly DivorceCare meetings. Daniel and Becky Lehmann began serving as a couple in DivorceCare ministry shortly after their marriage in 2013. Their care for those suffering through family breakup, however, hasn’t stopped there. They have transformed their home in Monteagle, Tennessee, into a mountain retreat where separated or divorced individuals stay to experience God’s healing. What’s the best analogy to describe the journey of separation or divorce? To Daniel and Becky Lehmann, the answer is simple: being lost in the wilderness. To accomplish that goal, Daniel and Becky lead a local DivorceCare group in Nashville. However, they’ve taken the ministry one step beyond by converting their home—which is situated on a bluff overlooking 2,000 pristine acres of the Appalachian Mountains—into a retreat for those experiencing family breakup. Located in Monteagle, Tennessee, the Lehmann’s home becomes a weekend retreat for people attending their DivorceCare group. It’s like a bed and breakfast, though designed specifically to serve as a healing mechanism. While spending a weekend at the house— which the Lehmanns have named Eagle’s Rest—individuals also go through outdoor, hands-on lessons that Daniel has developed. “We felt the need for there to be something available when DivorceCare sessions aren’t running—something short-term that complements DivorceCare,” Becky said. In creating the mountain retreat, the Lehmanns’ goal is rest and restoration, which captures the spirit of Isaiah 40:31: “But they who wait for the Lord shall renew their strength; they shall mount up with wings like eagles; they shall run and not be weary; they shall walk and not faint” (ESV). Even before their marriage, Daniel and Becky both individually had a heart to minister to people going through divorce recovery. The beginning of this desire for Daniel, who had served as a pastor, began a couple of years after his divorce in 2001. “To lose a family and an identity at the same time was a very difficult thing for me,” he said. Three years after his divorce, Daniel attended DivorceCare and received significant healing. Afterward, he felt called to become a facilitator because he could so well relate to the struggles of others experiencing the pain of divorce, especially those in ministry. Several years later, Daniel owned a residential alarm company. In 2009, he was put in contact with Becky as a client through a mutual friend. She was going through her own divorce after 29 years of marriage. She had served for years in women’s ministry and felt overwhelmed and displaced. He strongly encouraged her to attend a local DivorceCare group, and she did. They had occasional contact over the next several years and always had good conversations about the Lord and the healing process of divorce. During that time, Becky tried to set Daniel up with other Christian women because she thought he was a fantastic guy. Little did she know that she would become the right woman. After a year-long courtship, they married in March 2013. At that point, they decided as a couple to facilitate DivorceCare. They both have a desire to use the “mess” of divorce as a “message” of God’s grace and redemption. They have been leading ever since and have also gotten involved with heading up the Nashville area Local Network Fellowship meetings. Becky’s favorite verse, which she often shares with groups, is Isaiah 45:3: “I will give you the treasures of darkness and the hoards in secret places, that you may know that it is I, the LORD, the God of Israel, who call you by your name” (ESV). She encourages those hurting to search for the riches of God’s peace, mercy, comfort and daily presence during this journey that they will treasure long after the pain subsides. The Lehmanns are continuing to develop Eagles Rest. Soon, they hope to open up the mountain retreat to DivorceCare groups throughout the Southeast. Everyone enjoys an inspiring story of reconciliation. Gary and Diana Bly walked a path of divorce and then remarriage—and DivorceCare played an important role in bringing about the renewal of their lives as a couple. Gary and Diana Bly got divorced in April 2000, on the verge of their 28th wedding anniversary. Little did they know that just over a decade later, the Lord would bring them to reconciliation and remarriage—partly through the renewal they both experienced by attending, and later facilitating, DivorceCare. “Ultimately, DivorceCare set the stage for our remarriage by helping us to heal,” Diana said. Their 11-year journey back to the marriage altar began shortly after their separation, when Diana started attending Christ Fellowship in Palm Beach Gardens, Florida, and became involved with the singles ministry. Several fellow believers encouraged her to attend DivorceCare. The 13-week course greatly aided her recovery process. Around a year later, Diana was reading the Bible one morning when she felt the Lord nudge her to volunteer as a DivorceCare facilitator. Soon, she began to serve in that capacity. Meanwhile, God was working in Gary’s life in a similar way. After their divorce, Gary moved from Palm Beach to Ft. Lauderdale. Eventually, Gary had a chance to move back to Palm Beach. In the providence of God, he ended up attending Christ Fellowship, where Diana was still fellowshipping. “We hung around with some of the same people, but in groups, and we weren’t really looking to get back together,” Gary said. The big change happened one day when Diana had a gap in her DivorceCare leadership schedule that needed to be filled. She knew that Gary had prior experience with DivorceCare, so she called him up and asked if he would be willing to volunteer. “Things led on from there, and the next thing you know, we got remarried,” Gary said. “We became friends again,” Diana added. The Blys credit leading DivorceCare as one of the reasons for their remarriage. “When you’re going through divorce and you’re hurting, one of the ways that you can heal is to reach out and help other people,” Gary said. Since their remarriage in 2011, the Blys have continued serving as DivorceCare facilitators, though they handle their remarriage carefully with participants. What will your DivorceCare group’s legacy be? Even the most committed facilitator one day has to step aside into retirement. Karl Kay made that transition successfully. In 2014, Karl Kay faced a dilemma. Three years ago, he had launched a successful DivorceCare group at his home congregation, the Compass Church, in Naperville, Illinois. God’s hand was on the group—it averaged 20 to 25 men and women per session. Lives were being restored. But now, Karl encountered a problem. Recently, God had placed a call on his life to move to the northern suburbs of Chicago and take a teaching position with a Christian college. Without his leadership at the Compass Church, what would happen to the DivorceCare group? Would it flounder? Would it end? Thankfully, Karl had taken steps to prepare for this scenario by identifying and training a replacement leader. Karl took a proactive, forward-thinking approach to leadership development. To kick off each winter session of DivorceCare, he would organize a Surviving the Holidays event in early December. At that event, he designated certain people as table leaders—individuals who had been through divorce before, were already leading in other church ministries, and showed an aptitude for serving as facilitators. One of his table leaders, Pam Dreyer, stood out in particularly. She continued to help lead as the normal DivorceCare schedule began in February. “This was the first part of the leadership transition—to have someone I know and trusted lead a table,” Karl said. He soon realized that he wanted to begin co-leading with Pam. It was helpful to have a mixed gender team, so that if a woman in the group needed special attention, Pam could step in. When the opportunity arose for Karl to move away, he took Pam and aside and told her that he wanted to transition leadership responsibilities. Today, Karl is taking a break from facilitating DivorceCare. He writes a regular email column called Napkin Notes and also has a book coming out soon. Throughout his time facilitating DivorceCare, Karl has had one overarching goal—to make the group about a long-term legacy of ministry, not reliant on people or personalities. His training of Pam has been the catalyst. “The way that DivorceCare works best is when you make it both fun and effective, loving people into the group, and continually pointing people to Christ,” he said. Gary and Kathy Fallon celebrated their 10-year anniversary in December 2013. Their road to the marriage altar took them straight through DivorceCare. Kathy could scarcely have imagined that her faithful service in the DivorceCare ministry would, one day, lead her to remarry. After enduring a painful divorce in 1988, Kathy went several years without experiencing true healing. That changed in 1995 when her church, Calvary Chapel in Ft. Lauderdale, Florida, was one of the first to adopt the new DivorceCare curriculum. Kathy was part of a single-parent group that requested the church purchase DivorceCare. Pursuing another relationship was well off Kathy’s radar, but God was working behind the scenes. Around the year 2000, Gary came to Calvary Chapel and expressed interest in leading a DivorceCare group, having already gone through two sessions as a participant at another local church. He had been married for 18 years with three kids when his wife left him in 1996. “I went through a healing process to the point where I wanted to give back and eventually be a volunteer leader in a DivorceCare group,” Gary said. Eventually, Gary took the plunge and asked Kathy out on their first date: a singles breakfast organized by their church at a local hotel with 500 singles attending. Kathy said yes. In the following months, Gary and Kathy’s best dates were after their DivorceCare group met on Thursday nights. They would go out for dinner and discuss the group and what God was doing. “I fell in love with Gary’s heart,” Kathy said. After three years of dating, Gary and Kathy got married—on December 20, 2003. The very next month, as a newly married husband and wife team, Kathy and Gary returned to continue leading DivorceCare in their church. During that time, they developed a leader-training seminar for leaders within a 100-mile radius of Calvary Chapel. “That kind of training model really took off,” Gary said. The success of the seminars prompted Church Initiative to request that Kathy and Gary train leaders on a national scale. They developed a training model, created the materials, became the first instructors to roll out the new training model, and traveled the country for the next two years doing the training. In 2009, Kathy and Gary had the unique opportunity of joining the DivorceCare staff in Wake Forest, North Carolina—Kathy as a full-time ministry coach and Gary in a dual role as a ministry coach and director of the ministry coach team. They worked in those roles on-site for two years, but by 2011 they were missing their grandkids back home in Florida so much that they decided to return home. Kathy kept her role as a DivorceCare ministry coach on a remote basis. She continues to serve to this day, while Gary chose to open doors for freelance ministry in his calling in Christian media and continued in his role as an adjunct professor. “Our life’s calling has always been divorce ministry. That’s what drew us together as a couple. We found each other in ministry and continue in that calling leading DivorceCare in our local church today,” Gary said. Janice Copple has served in the DivorceCare ministry almost since its beginning two decades ago. She was the first facilitator of the program at Saddleback Church, now one of the largest mega churches in the United States. Still reeling from her second divorce, single mom Janice Copple moved to Rancho Santa Margarita in California in 1996. Little did she know that God was at work—both to heal Janice and to use her as a conduit of healing for others. Janice’s local network of friends encouraged her to attend Saddleback Church in nearby Lake Forest. She decided to follow their advice. She packed up her kids and attended her first Sunday on Mother’s Day. Immediately, she knew that God wanted her at Saddleback. After Janice got plugged into the church, leadership realized that her background—in counseling and teaching—was a perfect fit for a new curriculum that had just come out: DivorceCare. Leaders asked Janice to preview the VHS tapes. After viewing them, Janice was instantly captivated by the quality and depth. With the help of another co-leader, Janice launched DivorceCare in her home. She averaged 13 in attendance in the beginning weeks, but soon the group grew too large for her house, so they moved the meetings to the church. In addition to helping others, DivorceCare had an immense healing impact on Janice herself. Obviously, the group at Saddleback has grown significantly over the years. Janice compares it to a rollercoaster ride. They once offered the program two times a year; now they run it continuously throughout the year, every Friday night. Aside from God’s overarching blessing on the group, one of its success factors has been a personal touch, according to Janice. At the beginning of each group, they designate certain individuals to share testimonies before they start watching that week’s video lesson. “If you can get people to connect with you through personal stories, they will come back,” Janice said, adding that groups at Saddleback now average up to 30 participants each meeting. Janice views her leadership team as the equivalent of a small group for her. These are dependable people who will show up if she needs to take time off. For facilitators, she looks for people who are good listeners, who can direct conversations so that everyone can share, and who connect personally with participants. Janice is now 70 years old, but she has no plans to slow down. Her ministry is DivorceCare, and she still senses God’s calling to continue. “It’s my spiritual gift to help those suffering in this way,” she said. We’ve made the process of ordering, planning, and starting a DivorceCare group at your church easy. Your DivorceCare kit includes all the tools you need for effective weekly divorce-recovery ministry. As a DivorceCare leader, you’ll enjoy access to our team of ministry coaches plus the LeaderZone, an online community and resource library that supports your mission. DivorceCare features more than 50 top Christian experts on divorce and recovery topics. Many churches report that over 85% of group attendees are not from their church, and half do not have an active spiritual life and are not followers of Christ. DivorceCare becomes a great entry point for participants into the life of your church. More than 14,000 churches worldwide are equipped to offer the DivorceCare program. Try DivorceCare for 30 days with Our Satisfaction Guarantee.